The Belotero® range consists of advanced dermal fillers made of hyaluronic acid which offer an excellent skin integration. The Belotero products are ideal for smoothing and filling wrinkles as well as for lip augmentation, skin rehydration and for restoring facial volume. What are Belotero Dermal Fillers? Reducing lines and wrinkles, restoring facial volumes and rehydrating skin. Belotero is the natural choice for reducing the appearance of lines and wrinkles, restoring facial volumes and rehydrating skin. The Belotero products are dermal fillers made of hyaluronic acid, which is a natural component of the skin. Belotero can be used effectively in different treatments depending on the individual needs. During the treatment Belotero filler will be injected into the specific area of the skin to be treated using a very fine needle. Immediately refreshing results. · For deep rehydration, restoring radiance and elasticity of the skin (face, hands, neck and décolletage). · Immediate and smooth correction of fine to deep lines. · Crow’s feet and perioral lines. · Glabellar lines, nasolabial folds, marionette lines, lip contours, lip volume, oral commissures, Cupid’s bow. · Reconstitute and restore facial volumes in different areas (cheeks, cheekbones, chin and temples). Quick treatment, immediately visible results and natural-looking effect. Usually the treatment with Belotero fillers is quick, typically taking about 30 minutes. You will be able to continue your daily activities. · Immediately visible results and a more natural, refreshed and youthful look. · Long-lasting effects with visible results even between 12 and 18 months later. · Restore a healthy, youthful appearance that lasts. · Natural-looking effect and a smooth transition between the treated and untreated areas. Belotero can restore volume and softness of the lips so they look naturally full and smooth. Belotero can also be used to enhance the vermillion border around the mouth to prevent lipstick seeping into the skin. The Cupid’s bow can be shaped to give a sculpted, alluring look. Perfect for treating the face, hands, neck and décolletage. Radiant, firm skin is a sign of inner health, yet daily stress takes its toll on how we look. Rehydration treatments help revive your complexion while improving your skin’s firmness, tone and elasticity. Hyaluronic acid is used for wrinkle prevention as well as for active rehydration, tightening and smoothing of the skin of the face, neck, décolletage and the back of hands. Rehydration of the dermis to restore radiance and elasticity. 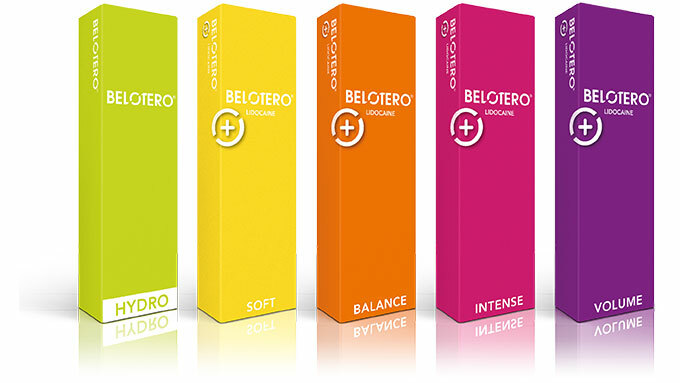 Belotero is ideal for refreshing facial volumes in different areas like cheeks, cheekbones, chin and temples. Once injected, it acts like a cushion, supporting facial structures and tissue that may have lost volume and elasticity. Nose-to-mouth lines, also called nasolabial folds, can be the most noticeable of all lines on the face. Belotero will smooth them away and leave you with a subtle, even result. Belotero can be used to correct of superficial lines, even in very sensitive skin areas. Some Belotero Fillers are available with lidocaine to maximise your treatment comfort. Lip enhancement with an injectable aesthetic product requires a less-is-more approach for a natural-looking result. Injections with Belotero can be given gradually during different appointments until the desired outcome is achieved. Belotero is a Dermal Filler for an refreshed, youthful look. It contains hyaluronic acid and glycerol for lasting dermal rejuvenation. These winning combination of Hyaluronic acid and glycerol provides you the ultimate skin rehydration.